Macroeconomic research on human capital - the stock of human capabilities and knowledge - has been extensively published but to date the literature has lacked a comprehensive analysis of human capital within the organization. 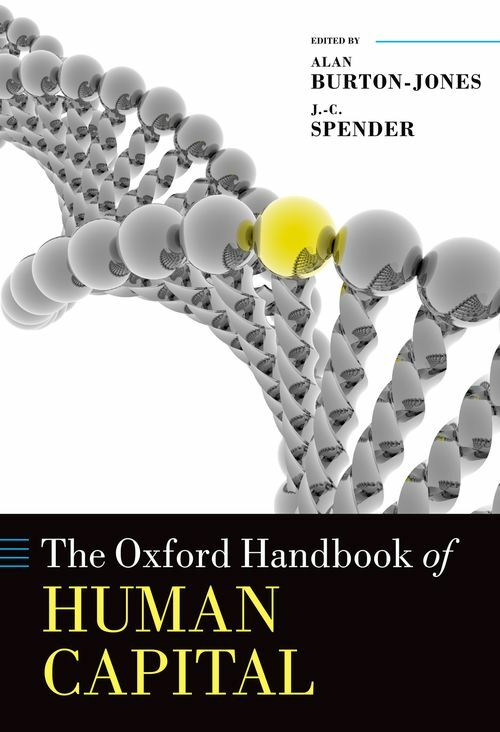 The Oxford Handbook of Human Capital has been designed to fill that gap, providing an authoritative, inter-disciplinary, and up to date survey of relevant concepts, research areas, and applications. Specially commissioned contributions from over 40 authors reveal the importance of human capital for contemporary organizations, exploring its conceptual underpinnings, relevance to theories of the firm, implications for organizational effectiveness, interdependencies with other resources, and role in the future economy. Unlike neoclassical macroeconomic concepts of human capital, human capital in organizations is shown to be dynamic and heterogeneous, requiring new theories and management frameworks. The systemic role of human capital is explored, revealing it as the lynchpin of social, structural and other forms of intangible and tangible capital. Connections between human capital and organizational performance are investigated from HR management, procurement, alignment, value appropriation, and accounting perspectives. Links between micro and macro perspectives are provided through analyses of inter firm human capital mobility, national and regional human capital formation regimes and industry employment relations practices. This Handbook is designed for scholars and graduate students of organization and management theory, strategy, entrepreneurship, knowledge and intellectual capital, accounting, IT, HR, IR, economic sociology and cultural studies. For policy makers and practitioners it should provide an up to date guide to the nature and role of human capital in contemporary organizations and the roles that government, industry and other extra firm institutions can play in facilitating its development. Alan Burton-Jones heads an international management consultancy practice headquartered in Australia and is a senior visiting lecturer at New South Wales, Griffith and Bond Universities. His academic research focuses on the role of knowledge in organizations and the links between strategy, intellectual resources and organizational effectiveness. He is the author of Knowledge Capitalism: Business, Work and Learning in the New Economy (Oxford University Press, (1999) (Nikkei 2002) and his writings have also been published in a number of leading international journals. He contributed to the Australian government report on the knowledge-based economy in APEC countries (DISR 2000) ,the first national Knowledge Management Framework published by Standards Australia and the establishment of the Asia-Pacific Learning and Knowledge Management Council (pan-Pacific industry forum). ; J.-C. Spender served in experimental submarines in the Royal Navy, then studied engineering at Oxford (Balliol), worked as a nuclear submarine reactor engineer with Rolls-Royce & Associates, a sales manager with IBM (UK), a consultant with Decision Technology International (Boston), and an investment banker with Slater-Walker Securities. His PhD thesis (Manchester Business School) won the Academy of Management's 1980 A.T. Kearney PhD Research Prize, later published as Industry Recipes (Blackwell, 1989). He served on the faculty at City University, London, York University, Toronto, UCLA, and Rutgers. He was Dean of the School of Business and Technology at SUNY/FIT before retiring in 2003. He now researches, writes, and lectures on organization theory, strategy and knowledge management in the USA, Canada, and Europe, with Visiting Professor appointments at Lund University, ESADE, Cranfield, Leeds, and Open Universities.